Life is all about making hard decisions, isn’t it? While trying to choose between Kindle Voyage and Kindle Paperwhite might well be considered a first world problem by some, it certainly can be a real dilemma if you’re a book enthusiast who wants to harness the power of e-books but you don’t know which device would work best. is available for far less. Is price the most important element when deciding what you buy? For us, price is always a factor but it should never be the determining factor. 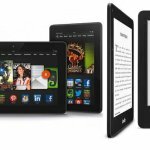 is already a first-rate e-book reader, what possible improvements could Amazon add to make it better and justify charging much more for it? Well, we’re updating this article to reflect the all-new Paperwhite 2018 which is now a millimeter thinner, fully waterproof and with an improved 300 ppi of resolution. Voyage is slightly slimmer, smaller, and lighter. Paperwhite was already very user-friendly in terms of weight and size but we always appreciate any decrease when it comes to our gadgets so the slimline look is welcomed. In all-new Paperwhite form, it’s now even slimmer than ever without costing any more. 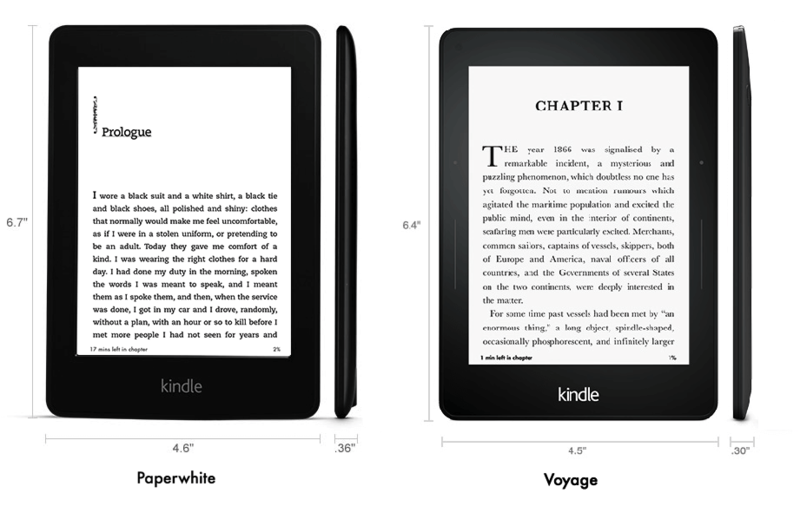 Kindle Voyage has a flush glass screen instead of the rubber edges found on Paperwhite. The Voyage screen goes neatly from edge to edge like your phone or tablet. This, in addition to the paper-like finish and 300 ppi (pixels per inch), is probably one of the key advantages of Kindle Voyage. All-new Paperwhite has a flush screen. Old aperwhite displays 212 ppi with a jump to 300 ppi in the new waterproof Paperwhite. This is more than acceptable but the contrast and sharpness is noticeably higher on the Voyage. What everyone loves about the Kindle e-reader series is that amazingly long-lasting battery. Kindle Voyage gives you up to 6 weeks on a full charge if you read for 30 minutes every day with Wi-Fi off and the brightness setting at 10. It charges fully within 3 hours. and takes on a full charge in around 4 hours. We have to say that 6 weeks of battery life is still outstanding. While Paperwhite undeniably gives you a little more juice, this is not something upon which you should base your entire buying decision. This is a feature in which you get small bezels you can press at the side of the screen to turn pages. These bezels are available on both sides of the screen and work for both right-handers and left-handers. Paperwhite does not have this function. You get a slight vibration to let you confirm that the page-turn has been successful, although you can obviously see this for yourself. The old swipe and tap option to turn pages still works on both devices. 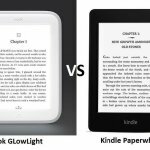 Both Kindle Voyage and Paperwhite has built-in front light. This enables you to read comfortably at night or in dim light without an additional light source or straining your eyes. Beyond this, light distribution is more even on the Voyage. Contrast is stronger, the background looks much brighter, and the text blacker and sharper on Voyage compared to Paperwhite. Voyage is a refined version of the Paperwhite with a few bonus features. This comes particularly to the fore with the superior quality of text. 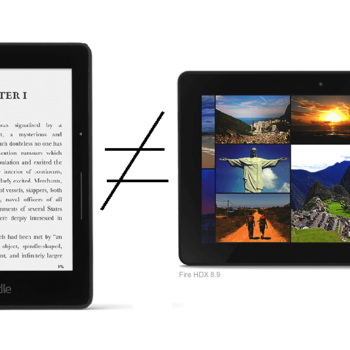 This, after all, is the core reason for buying an e-reader so do not overlook this difference. Paperwhite, on the other hand, is for people who love reading e-books, but can manage just fine without the finer design tweaks and enhancement of page-turning. If you’re looking for an e-reader you can use by the pool or in the beach, all-new Paperwhite makes perfect sense. Last updated by Sarah Lewinsky at October 18, 2018 . I rarely say “Thanks” after reading a review, or after reading anything at all. Your superb review is an exception to this rule. Thank you. A first world problem has just turned into a good decision. I am buying Voyage. 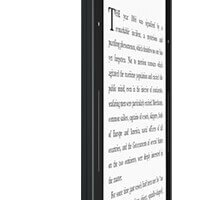 Did you see that Amazon released a 300 ppi Paperwhite? Thank you this was a great review. I wonder when they will bring in a little page turning remote so you can keep your hands nice and warm under the covers.